In 2013, Simon and Schuster published The Heart of Everything That Is: The Untold Story of Red Cloud, An American Legend. White people loved it. They bought it. They praised it. It became a New York Times Bestseller. White people love The White Man's Indian. And so--unsurprisingly--Simon and Schuster decided they ought to make it available to young people, too. The "young readers edition" came out in February of 2017 from Margaret K. McElderry Books. It was adapted for young readers by Kate Waters. Shall we take a quick look? First is the subtitle "The Untold Story of Red Cloud, an American Legend." Untold? What does that mean?! To me, it means that Drury and Clavin see themselves as saviors. Gonna tell the world, they are, the "untold" story of Red Cloud. Untold... to what person, in particular? Oh, I get it... What they mean is a different kind of story about Red Cloud! Their book, we are expected to believe, will be different than the 2,272 books that came up when I searched WorldCat using "Red Cloud" in the search box. I have doubts, because being Good White People means... lot of blind spots! Like how Drury and Clavin think of him, right there, on the cover. To them, he is "an American legend." Would Red Cloud call himself an American? The dedication page tells us that the book is dedicated to "the children of the Pine Ridge Indian Reservation." Oh. Ok. Sounds a lot like all those ways that White people think they honor Native people. Dedicating books to us, donating a percentage of their sales to us, creating stories about us... how nice! (Yeah, that "how nice" is me being snarky). Veteran braves grunted and yipped in approval. See that? They grunt. And yip. This adaptation will diminish Red Cloud's legacy, perpetuate negative stereotypes, and provide incorrect information to young readers: skip." "Not recommended for purchase. Consider Joseph Marshall III's In the Footsteps of Crazy Horse instead for a fictional look at a Lakota leader." Laura is right! Get Marshall's book instead! I hope you didn't order this young readers edition because the adult version did so well. 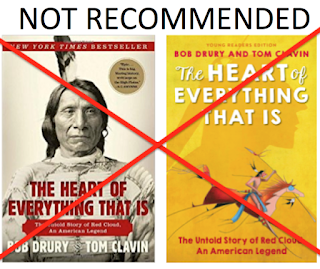 You should take a look at this essay in Indian Country Today: The Heart of Everything That Isn't: The Untold Story of Anti-Indianism in Drury and Clavin's Book on Red Cloud. 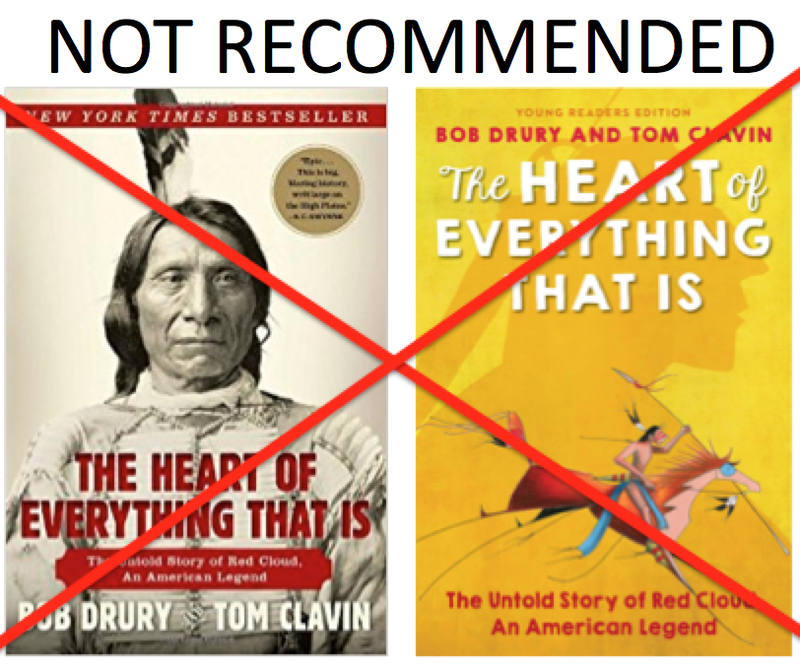 In short, I do not recommend the 2013 or the 2017 editions of The Heart of Everything That Isn't by Drury and Clavin. Excuse me? "White people loved it. They bought it. They praised it." Do you have any statistics to back up these claims? Were white people the only buyers of this title? The only ones who loved it? I do not disagree with your review of either version of this title, but this language is extremely concerning to me and other POC who are readers, book buyers, library users, and book review readers and writers. The call for statistics to "back up" a claim is familiar. She does ask a question that I can toss back out as this: does anyone think that it is Native and People of Color who made this 2013 edition a best seller? I could just say "People loved it." Shall I go back and say that? She's right, though. I'm sure some people of color loved it. In children's lit and elsewhere, people disagree about things. Institutionalized racism is everywhere. Debbie--have you seen SISTERS IN BLUE/HERMANAS DE AZUL by Anna M. Nogar and Enrique R. Lamadrid? A reader wrote to ask if I've seen Sisters In Blue/Hermanas de Azul by Anna M. Nogar and Enrique R. Lamadrid. Illustrations are by Amy Cordova; publisher is UNM Press, and the publication year is 2017. Frankly, I'm usually suspicious of books that emphasize similarities amongst people when the history of interactions between these particular peoples is so fraught with horrific and oppressive actions. If I get a copy, I'll be back with a review.